Pre-order RELOADED Now and Instantly Get The Hit Single "Noise" and "I Want To Be Loved Like That," Available Digitally For The First Time! 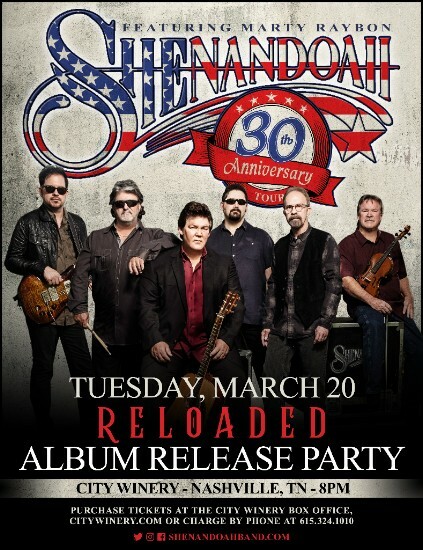 NASHVILLE, Tenn. – The wait is over as GRAMMY®, CMA and ACM-winning group Shenandoah celebrates their first country album in 20 years with a party at City Winery Tuesday, March 20 that will include performances from several surprise guests! CLICK HERE to purchase limited tickets. Fans will also have a chance to win 2 tickets and meet the band by entering to win through Do615. Their timeless catalog of No. 1 hits and harmonies led by frontman Marty Raybon, and founding member Mike McGuire, solidified Shenandoah as a country music mainstay. And now, back together and on the road, they’re RELOADED with new music on a new album released by BMG packed with their iconic hits recorded LIVE last year on tour, along with 3 brand new songs produced by Jay DeMarcus. CLICK HERE to pre-order RELOADED (available everywhere March 16). Shenandoah continues captivating audiences nationwide with their high-energy show and new single "NOISE," which is currently No. 33 in the nation on the Music Row Radio Chart. Over the last 30 years, the band has recorded 9 studio albums, 13 No. 1 records and charted 26 singles on the Billboard country charts. Their No. 1 hits include “Two Dozen Roses,” “Church on Cumberland Road,” “Next to You, Next to Me,” “I Want to be Loved Like That,” “Sunday In The South,” “Somewhere in the Vicinity of the Heart” and many more. For more information, visit ShenandoahBand.com or follow them on Facebook, Twitter and Instagram. March 24 Sugar Creek Casino Hinton, Okla.
April 06 City Stage - Lynn Haven, Fla.
April 13 Railroad Festival - Amory, Miss. April 20 Ho Chunk Casino - Black River Falls, Wisc. May 04 Gilley’s Choctaw Casino - Polola, Okla.
May 12 Niswonger PAC - Greenville, Tenn.
May 11 The Stage at Center Star - Bossier City, La. May 18 Camp Douglas Armed Forces - Camp Douglas, Wisc. May 26 City of Grafton Celebration - Grafton, W.V. June 09 Downtown Carlsbad - Carlsbad, N.M.
June 16 Cameron Elks Lodge’ Fundraiser - Cameron, Mo. June 17 Porterfield Country Music Festival - Marinette, Wisc. June 30 Tolchester Marina - Chestertown, Md. July 28 Dundy County Fair - Benkelman, Neb. August 22 Grange Fair - Centre Hall, Pa.
August 25 Tivoli Theatre - Chattanooga, Tenn.
Sept. 01 Loretta Lynn Ranch - Hurricane Mills, Tenn.
Oct. 11 The Ritz Theatre - Greenville, Ala.
Oct. 19 Country Tonite Theatre - Pigeon Forge, Tenn.
Nov. 08 Center for Rural Development - Somerset, Ky.
Nov. 24 The Caverns - Pelham, Tenn.
GRAMMY®, CMA and ACM-winning hitmakers Shenandoah are celebrating 30 years of chart-topping hits as the group gears up for new music and non-stop touring in 2018. Fueled by Marty Raybon’s distinctive vocals and the band’s skilled musicianship, Shenandoah became well known for delivering such hits as “Two Dozen Roses”, “Church on Cumberland Road” and “Next to You, Next to Me” as well as such achingly beautiful classics as “I Want to be Loved Like That” and the Grammy winning “Somewhere in the Vicinity of the Heart” duet with Alison Krauss. Today that legacy continues as original members Raybon and Mike McGuire reunite to launch a new chapter in Shenandoah’s storied career. Raybon and McGuire formed the band in 1984 in Muscle Shoals, Alabama with bassist Ralph Ezell, keyboardist Stan Thorn and guitarist Jim Seales. Shenandoah inked a deal with the legendary label and began establishing a national fan base with their self-titled debut in 1987. However, it was the band’s sophomore effort, The Road Not Taken, that spawned their first top ten hits—“She Doesn't Cry Anymore” and “Mama Knows.” Shenandoah followed with three consecutive No. 1 hits—“Church on Cumberland Road,” “Sunday in the South” and “Two Dozen Roses.” “The Church on Cumberland Road” spent two weeks at the top of the chart and made country music history as it marked the first time that a country band's first No. 1 single spent more than one week at the summit. It also helped propel sales of the album to more than half a million units thus giving Shenandoah their first gold album. Shenandoah became known for delivering songs that celebrated the importance of faith and family while reveling in the joys of small town life. “Next to You, Next to Me” topped the charts for three weeks and “Somewhere in the Vicinity of the Heart,” a beautiful duet with Alison Krauss, won a Country Music Association Award for Vocal Event of the year and a Grammy for Best Country Performance by a Duo or Group with Vocal. 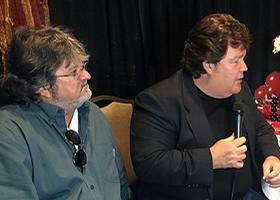 Shenandoah also won the Academy of Country Music’s Vocal Group of the Year in 1991. Shenandoah recorded nine studio albums and placed 26 singles on Billboard’s Hot Country Songs chart.